Vladimir Karlovich Sabler (Russian: Владимир Карлович Саблер), also known as Vladimir Karlovich Desyatovsky (Russian: Владимир Карлович Десятовский), was the Ober-Procurator of the Apostolic Governing Synod (Holy Synod) of the Church of Russia from 1911 to 1915, the longest serving procurator among the last ten ober procurators who succeeded Constantine Pobedonostsev in 1905. Vladimir Karlovich was born near Tul'sk on November 13, 1845, the son of Karl Fedorovich Sabler, the chief quartermaster of the Russian Grenadiers, and Stefaniia Vasilevna (nee: Alekseevna). He studied law at Moscow University, graduating in 1872. In 1873, he joined the law offices of the Holy Synod, remaining there until 1905. Near the Sabler estate, near Kashira, he established a theological seminary for women with a six year course of study, the graduates of which were able to teach the Law of God in the public schools. Questions of church reform became serious issues for the Church and the Tsarist government as the twentieth century began. These issues included, amongst others, the calling a local council of the Church of Russia and the re-establishment of the patriarchate. These issues developed into differences and difficulties for Vladimir Karlovich with the ultra conservative position of Ober Procurator, Constantine Pobedonostsev. In the end, these issues caused Vladimir Karlovich to submit his resignation from the offices of the Holy Synod in 1905. In 1906, he was made a member of the State Council in St. Petersburg, a position he held until 1911. Then, on May 2, 1911, Vladimir Karlovich was recalled to the Holy Synod, this time as ober procurator, three years after Pobedonostsev's death. As Ober Procurator, Vladimir Karlovich maintained good relations with the hierarchs and was friends with the clergy and monastics. His working days were busy with a full waiting room each day with monks, abbots, archimandrites, and priests waiting for his services. 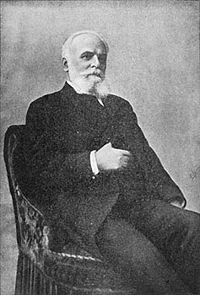 The question of convening a local council continued to be argued and often tentatively scheduled, but never actually accomplished, even after Pobedonostsev's retirement in 1905. In 1913/1914, Vladimir Karlovich was asked by the Duma about the council, but he could not give them a good answer as the issue was not one over which he had any influence. The presence of Rasputin and his injection into the proceedings of the Holy Synod were another distraction. In 1915, Vladimir Karlovich was dismissed as ober procurator. With the beginning of World War I, with Germany as Russia's chief opponent, Vladimir Karlovich chose to replace his German sounding name with his wife's maiden name, Desyatovsky. With the rise of the Bolsheviks after the October Revolution in 1917, Vladimir Karlovich chose to live as a private person. In 1918, he was arrested in Novocherkassk and taken to Moscow, but was released by the Cheka for "lack of evidence". He was exiled to Tver, where he lived out his life in poverty. He died on September 8, 1929 in Tver. This page was last edited on December 23, 2012, at 22:43.